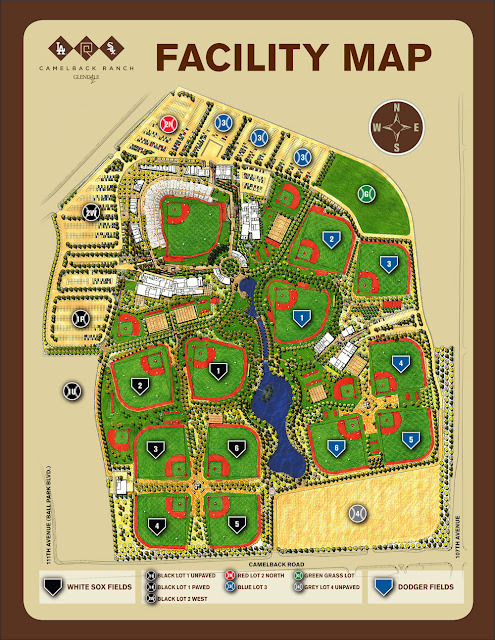 All home games are played at Camleback Ranch in Glendale, Arizona. It is the clubs 10th year here and it is a facility they share with the Chicago White Sox. The Dodgers have six practice fields and a 13,000 seat stadium; which includes 3,000 lawn seats, 12 luxury suites and a party deck. The site also features picturesque walking trails, landscaped grounds, an orange grove, two ponds and a lake. At the stadium two new shade canopies have been added on the first base concourse and will offer fans more shaded seat options, most notably in the Baseline Terrace sections. Also new in 2018, CR-G debuts a 30’ x 50’ Daktronics videoboard in right-center field. The new high definition videoboard will provide fans with a dramatic upgrade to the visual and interactive experience during spring training games. You can purchase tickets at www.dodgers.com/spring or by calling (800) 352-0212. Single-game ticket prices begin at $10 and fans can save by purchasing in advance (there is a $3 increase per ticket on game days). Every Sunday: Family Sunday — Children ages 12 and under may purchase a $5 lawn ticket. Valid at box office on day of game only. Limit four $5 lawn tickets per full-priced adult ticket purchased. Every Wednesday: Senior Stroll — Following every Wednesday game, seniors can stroll the bases at Camelback Ranch. Senior Special: Monday-Wednesday, seniors age 65 and over receive 50 percent off Infield Box or Baseline Field Box tickets. Valid at the box office on the day of the game only. Active and Retired Military Special: Monday-Wednesday, active and retired members of the military receive 50 percent off Infield Box or Baseline Field Box tickets. Valid at the box office on the day of the game only. Glendale Resident Pass — City of Glendale (AZ) residents can purchase $5 Baseline Reserved or Lawn tickets for Sunday – Thursday games. Proof of residency required; offer valid online at camelbackranchbaseball.com only. Below is the Dodgers Spring Training television and radio broadcast schedule, which includes 20 televised SportsNet LA broadcast, 16 radio broadcasts on AM 570 LA Sports and eight radio broadcasts on Univision Radio’s KTNQ 1020 AM. Spectrum SportsNet LA will lead off its live 2018 Dodgers Spring Training coverage on Access SportsNet: Dodgers on Tuesday, February 13, as the pitchers and catchers report to Camelback Ranch in Arizona. Studio programming will include Access SportsNet: Dodgers and it will showcase Dodgers news, highlights and exclusive interviews with Dodgers players, coaches and staff. Host will be John Hartung and Alanna Rizzo. Analysis will be done by Orel Hershiser, Nomar Garciaparra, Jerry Hairston Jr. and Ned Colletti. Backstage: Dodgers will debut its first spring training episode on Wednesday, March 14 following Access SportsNet: Dodgers. Joe Davis and Orel Hershiser will remain as broadcasters for games. 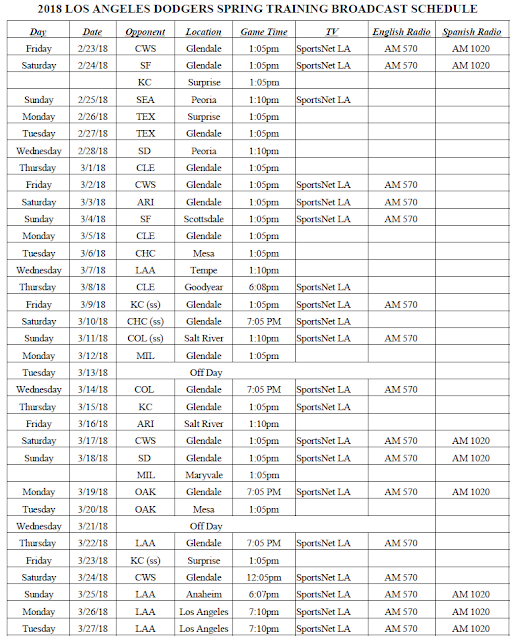 AM 570 LA Sports’ Spring Training Dodgers programming will once again include Dodger Talk, which will air each weeknight hosted by David Vassegh and will showcase all the latest Dodgers news, key highlights and exclusive interviews with Dodger players and coaches. Vassegh will be on-site in Glendale, Arizona providing daily analysis, special reports and exclusive interviews throughout Spring Training to other AM 570 LA Sports shows including Dodgers pre-game with Tim Cates, Lunchtime with Roggin & Rodney (noon-2 p.m.) and the Petros & Money Show (2 p.m.-7 p.m.).